Does anyone else look at Christmas gift guides and find they get more inspiration for themselves than they do for other people? I mean, I love hunting out thoughtful surprises for my nearest and dearest, but more often than not I end up zoning in on items that I didn’t even know I wanted… and then they get added right onto my own little wishlist for Santa. That’s basically how I’ve put this list of health and fitness gifts together – it’s everything I’ve spotted throughout the year, whether in gift guides, online or instore, that I’ve bought, used and loved myself, or has made me think: “I just gotta have it”. And as someone who is constantly on a health and fitness mission to improve myself, to work out more, to get fitter, to eat better, to look cuter (just for me, not for anyone else) and to simply ENJOY LIFE, I think this is a pretty excellent list – I hope it provides some solid inspiration if you’re buying for someone with a similar outlook in life. I’m usually incredibly practical when it comes to water bottles – my favorite ever is the fruit infuser water bottle because it’s a simple way to make boring water even more refreshing than usual. But then I spotted this superb range by S’well. I never thought I’d say this about a water bottle, but S’well have created a thing of beauty here – this is both practical AND a fashion statement. I would be utterly delighted to unwrap this on Christmas Day. Perfect for the traveling yogi in your life, or just anyone who doesn’t want the hassle of owning and storing a yoga mat. These Yoga Paws allow you to rock your downward dog anywhere you please because the cushion and grip are all in the mitts. I have a pair of these and they’re wonderful for just popping into my bag when I travel. This book is absolute gold for aspiring runners. Written with wit and pathos, it follows the real-life story of a woman who went from being a first-time racer to ultramarathoner. Even if your loved one has no plans to run as far as Valerio does, this should be all the inspiration they need to get their running shoes on and just enjoy their fitness journey, wherever it takes them. These cute headbands look great and stay put – meaning you can get on with your workout without having stray bits of hair fall onto your face. The hardest decision you’ll have is choosing which pattern to buy – this one is my fave, followed by this one. But you really can’t go wrong. To paraphrase one wise reviewer: there are so many colors on this thing that it’s bound to go with literally any workout clothes you own! Bingo! This is one for girls who lift! And who like pugs, of course. Not only is it a fun nod to strength training, it’s also crazy versatile. It could be used for storing toiletries, make-up, Sweaty Bands, jewelry, stationery – there’s always something that could do with being tidied away stylishly! I picked up a NutriBullet in January this year and have not looked back since. Juices, soups, smoothies – it does the lot. I use it to make my delicious smoothie bowls too. It takes up very little space on the kitchen counter and blends healthy meals and drinks in seconds. I love it! This is the perfect gift for busy people who LOVE fitness classes but can’t always commit to attending at a particular time. For a really inconsiderable amount of money per month, you get access to a whole host of pre-recorded classes from martial arts-inspired workouts, to weight training, spin, HIIT and yoga – it’s all there. It is honestly my favorite thing ever and I never get bored with these workouts because of the huge variety and the fact that they’re always releasing new classes every month. I’m more than happy to pay the subscription fee, but if someone bought me a year’s membership I would love them for life. I like to call this my ‘Mary Poppins’ bag because it’s insane how much stuff you can pack into this thing. There are lots of different compartments in there so you can separate out your gym shoes, dirty clothes and other bits and bobs, and it’s roomy enough to add your water bottle, toiletries and more – and it’ll still fit into the locker. There’s also a handy side pouch for quick access to smaller items. Winner! I rarely go to the gym these days because I tend to work out at home, but fortunately, it also doubles as an excellent overnight bag so I still get a lot of use out of it. I have no idea if it’s just the placebo effect at work, but when I’m feeling low energy and I just can’t motivate myself to get changed into my workout clothes, I light this candle for half an hour and BOOM! I’m pepped up and ready to go. There is no way you can feel lazy when there’s a zingy, lemony smell in the air. It also works for getting stuff done, getting going in the morning and generally feeling like you can take on the world! And, if lemon isn’t your thing, there’s an orange and ginger scent too. Very festive! If you’re buying for someone who likes their makeup on point while they workout, treat them to one of the best waterproof eyeliners out there. This little bunny should stay put through even the sweatiest of gym sessions. Pair it with some nourishing Burt’s Bees tinted lip balm, and tie it all together with the Pug Lift Carry-All Pouch for a super thoughtful gym makeup gift set! 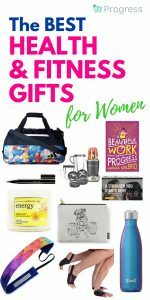 I hope you’ve found these health and fitness gift suggestions helpful! Here’s hoping Santa brings you everything you wish for and more. Feeling inspired? Why not share on Pinterest? When you’re on a health and fitness mission it makes sense to track your progress using a several different metrics. Sign up below to find out the four simple ways of tracking weight loss like a pro.